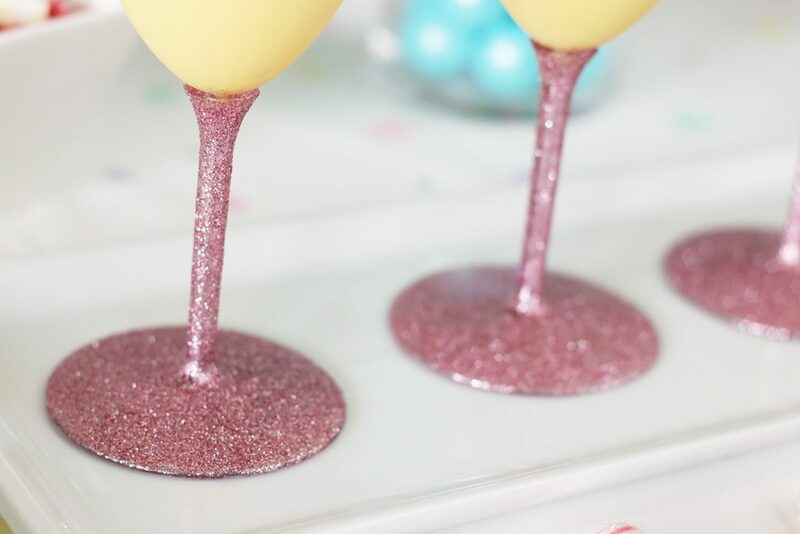 Let the magic and sparkle begin! If you have a little girl, chances are you can’t escape glitter, rainbows and unicorns on her clothing and accessories, toys and games. 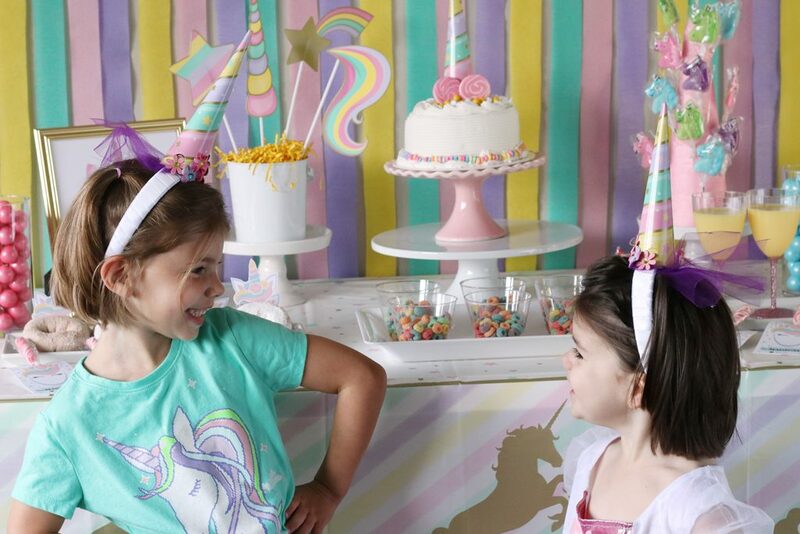 Give into this magical trend and fulfill her birthday wish with a birthday party featuring them all! 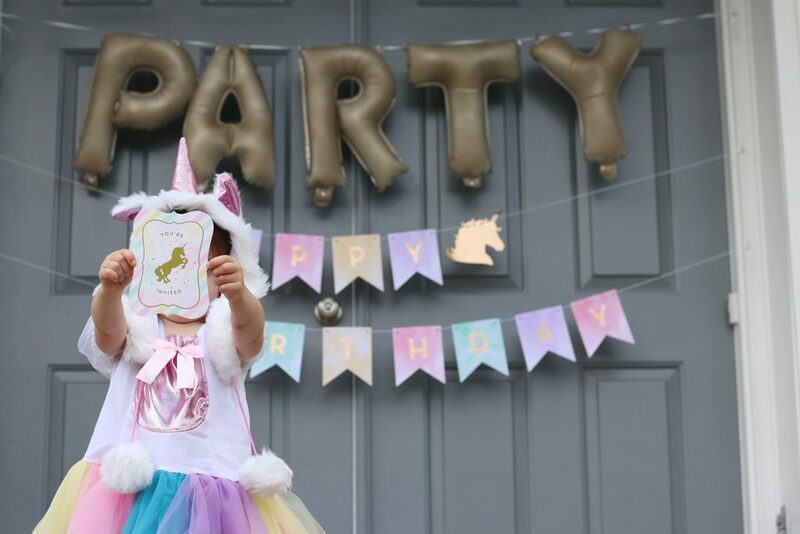 She’ll soon be on cloud 9 when seeing the sweet setup you create outside and inside your home with the help of our unicorn sparkle birthday party guide. 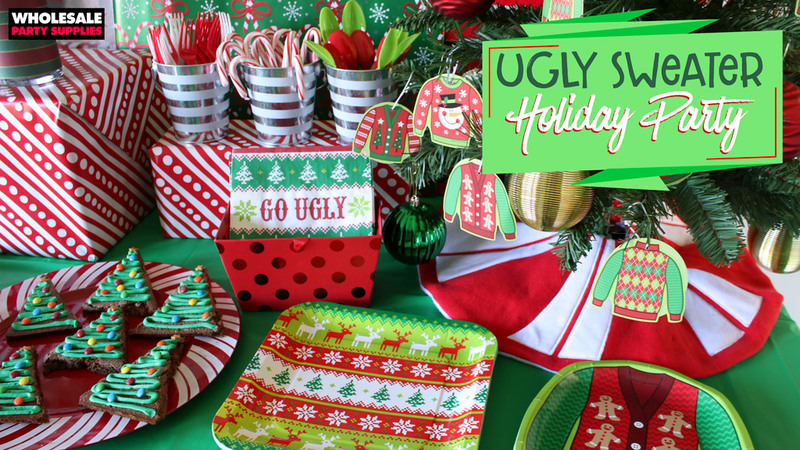 See how to mix and match coordinating party décor with some simple supplies to put on a party to remember! 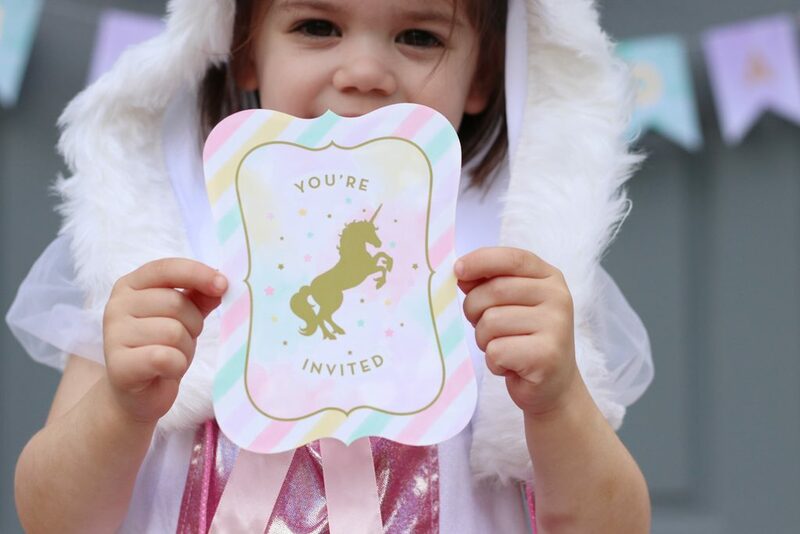 A magical party awaits your guests and it all starts with the invitation! 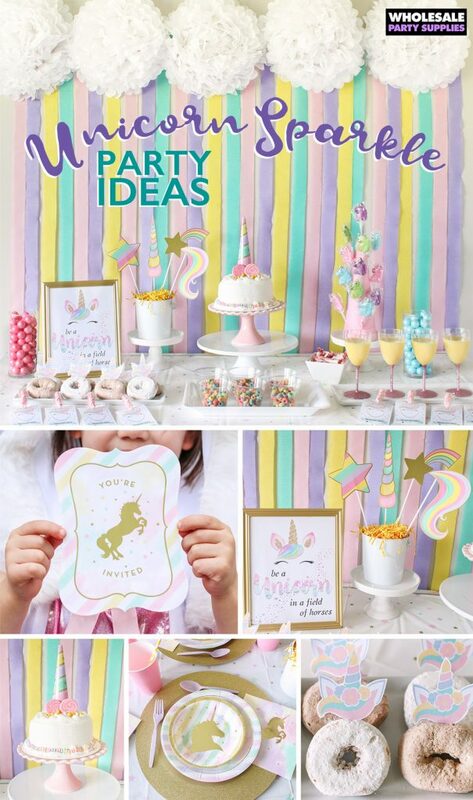 Send them your love and invite them to your enchanted afternoon with these unicorn sparkle postcard style invitations. Friends won’t mistake the party location when driving onto your street with this setup on your porch. 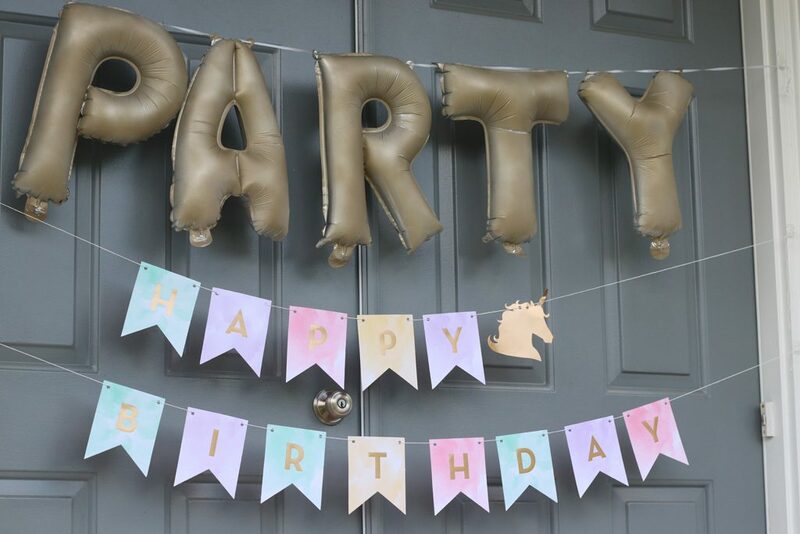 Use Command Hooks to string up a birthday banner and a balloon letter banner across your front door. Tip: If the balloon letters don’t match your party theme, spray paint them to color coordinate, like these party balloons we sprayed gold! 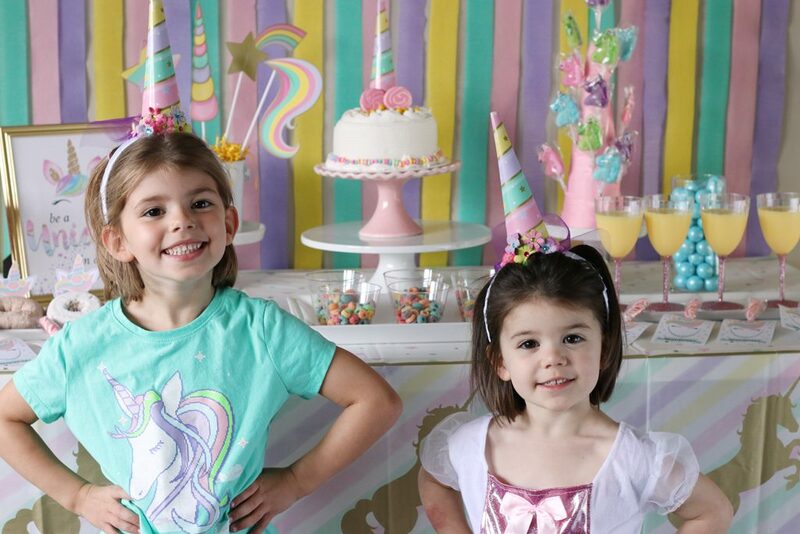 Being surrounded by unicorns could make you feel like you’re on cloud 9! 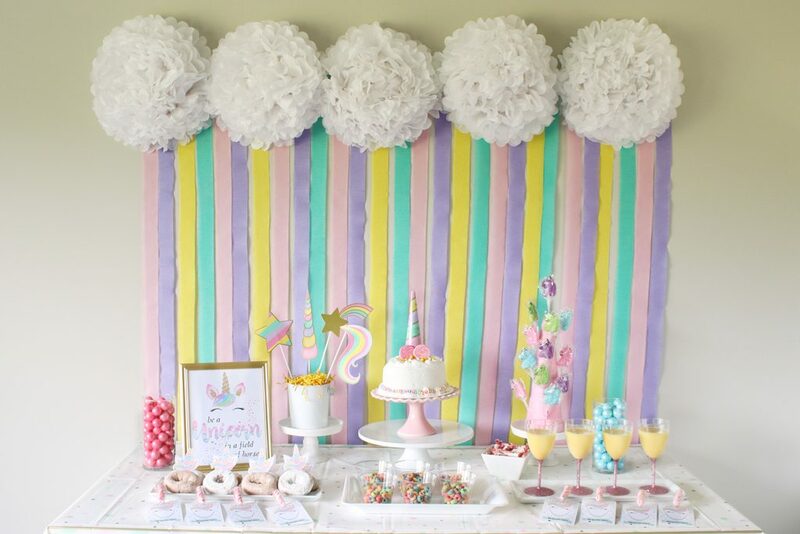 Make your friends have that same feeling and create a large cloud over your dessert table using white puff balls. 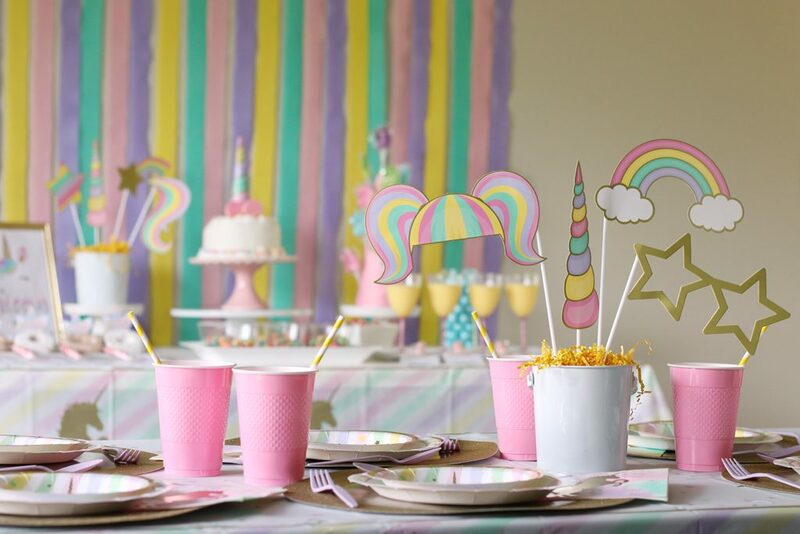 Dangle down crepe paper streamers of different colors that go with your party designs and let the fun rain down over your unicorn themed tablecloth. Photo props are great when it’s time to get the group together for some fun photos but until then throw them in a tin with some floral foam and use them as a centerpiece on your tables. 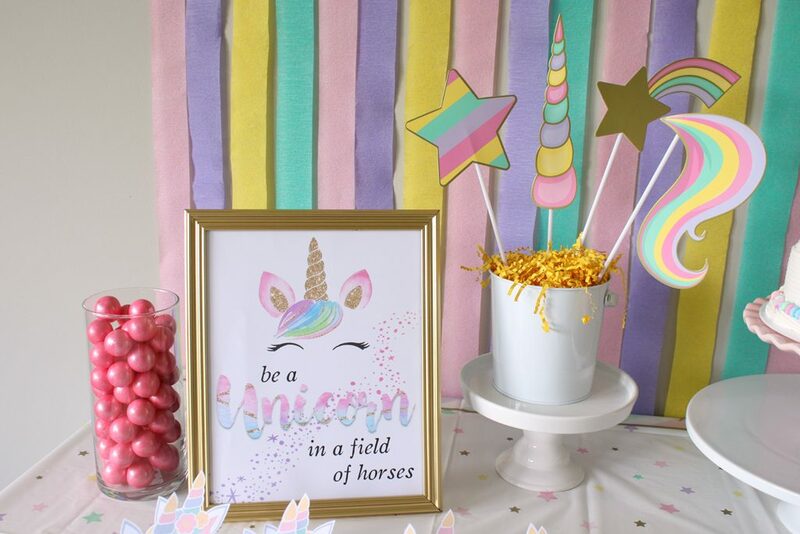 When it comes to little kids, use any opportunity to hit them with an inspirational message, like this unicorn themed print framed at your dessert table. 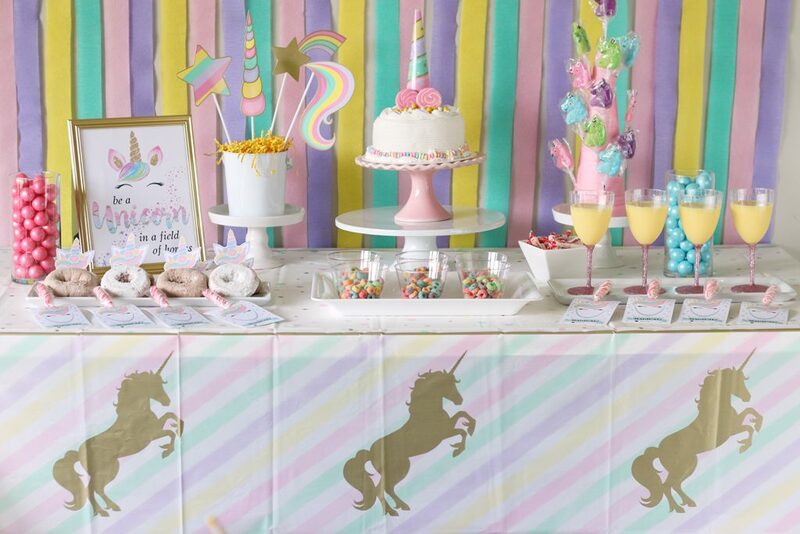 When it comes time to eat layer on the fun with plenty of tableware options in the Unicorn Sparkle Party Theme. 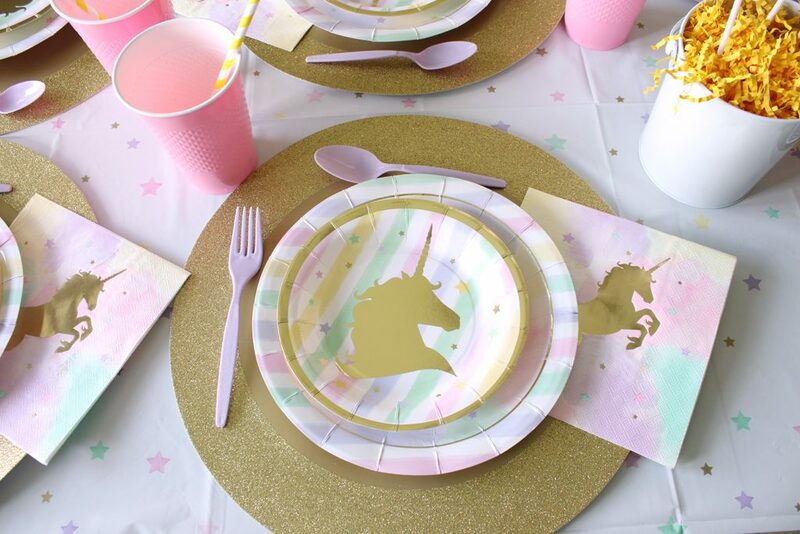 Spread out your Unicorn Sparkle tablecloth, add round glitter placemats and throw your matching lunch plate and cake plate (that PS is more of a bowl) on top. 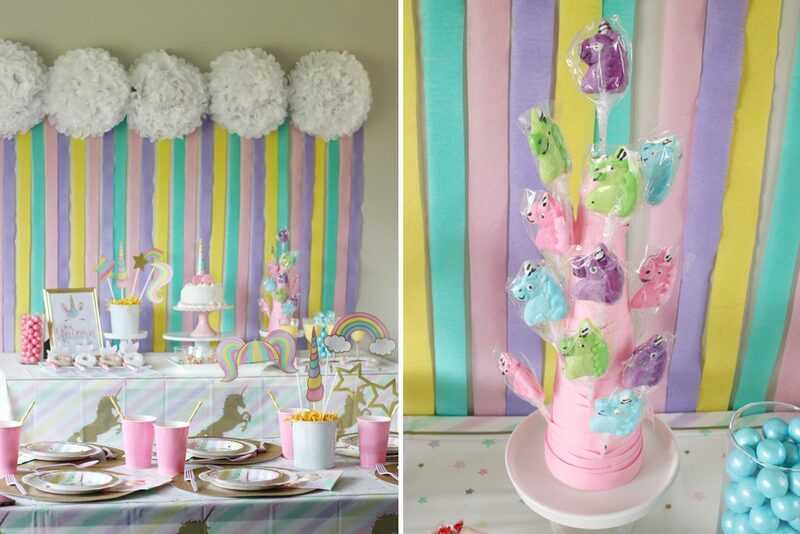 Fill your dessert table with treats that fit the color scheme or add a touch of rainbow. Tip: corral your desserts on trays, cake stands or plates for a clean looking display. 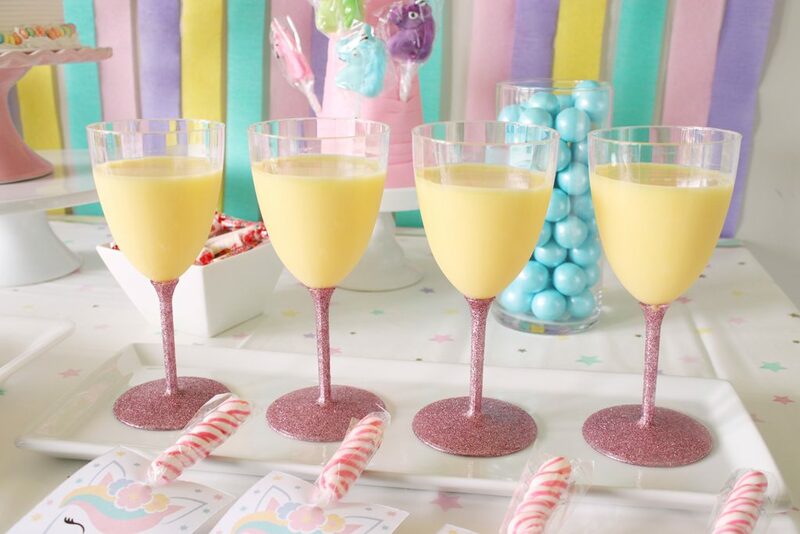 Vanilla pudding is anything but boring when you glitter the stems of your plastic drinkware! 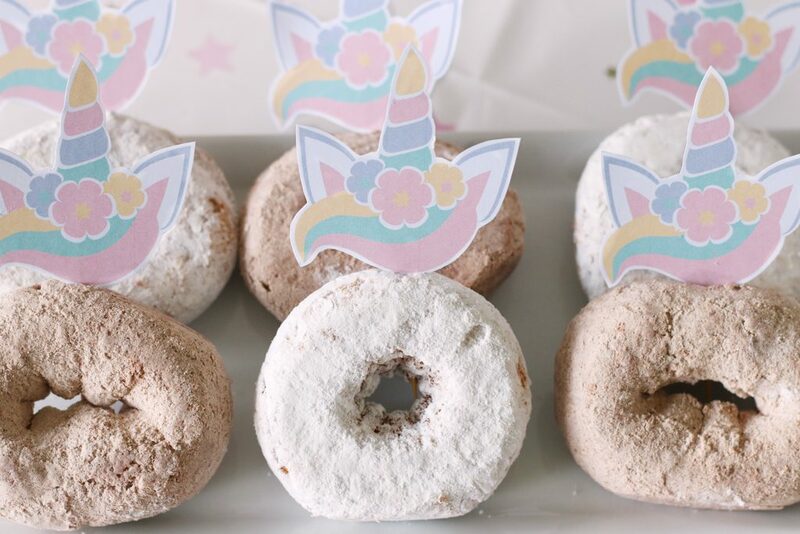 Dress up a donut with a printable topper to give it that magical horn and colorful mane. 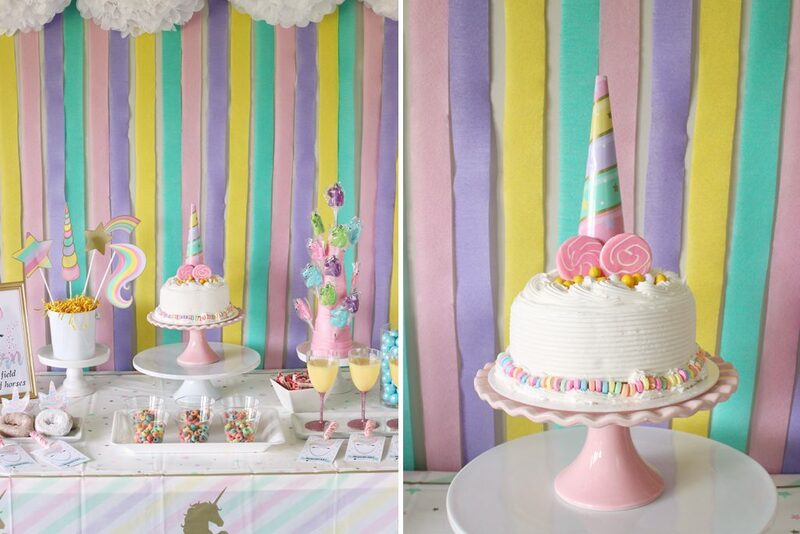 No need to spend tons at the bakery to make a unicorn cake for your unicorn sparkle birthday party. 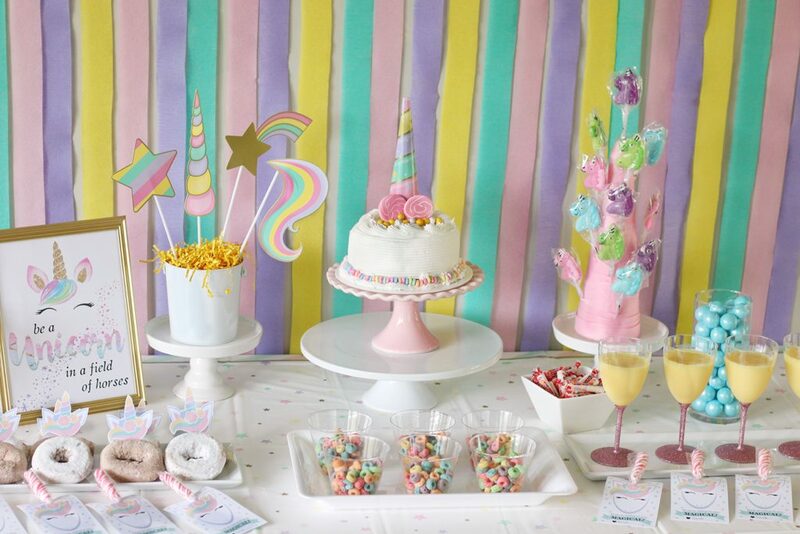 Make a basic shape at home or buy a grocery store cake and dress it up with the help of these unicorn cake topper pieces and colored frosting or one of the party cones and some lollipops. Unicorn lollipops are not only fun to look at and to lick but you can step the display up a notch when putting them into a ribbon wrapped foam cone! 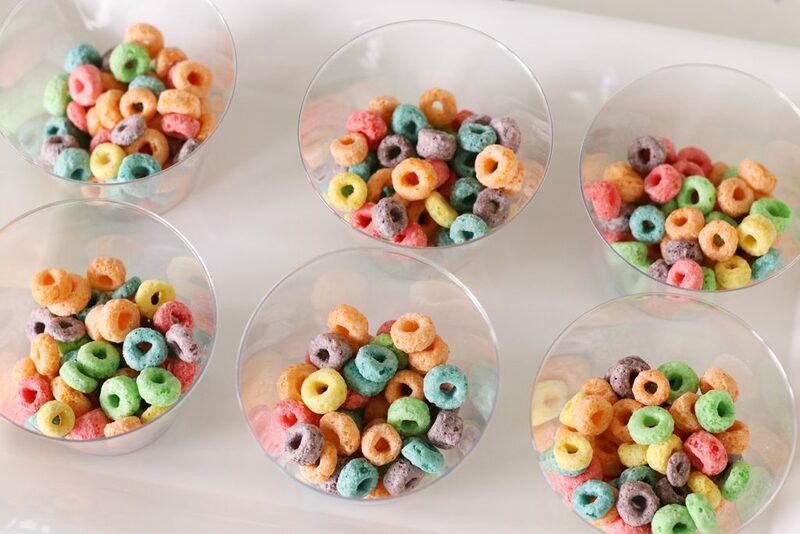 Fill cups with colorful fruit cereal to add some texture and a bit of crunch to the dessert selections. 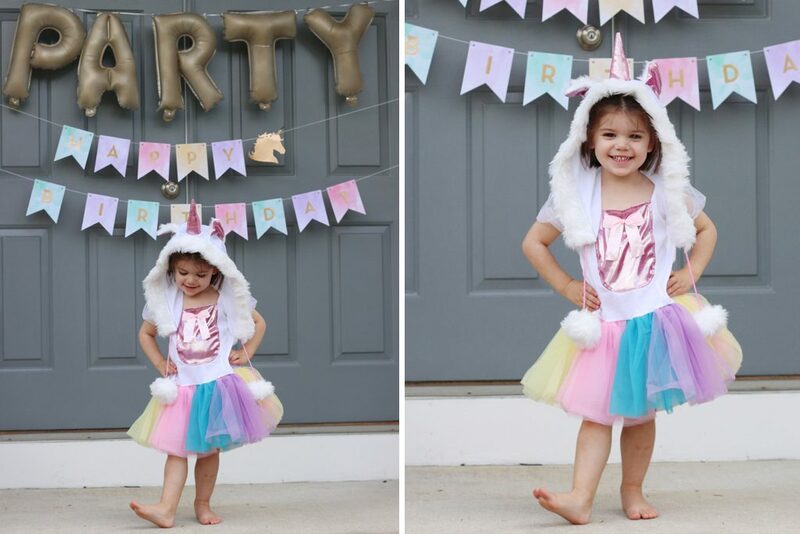 The birthday girl may be decked out in her own unicorn costume but that doesn’t mean the other party guests have to be left out of the dress up fun. 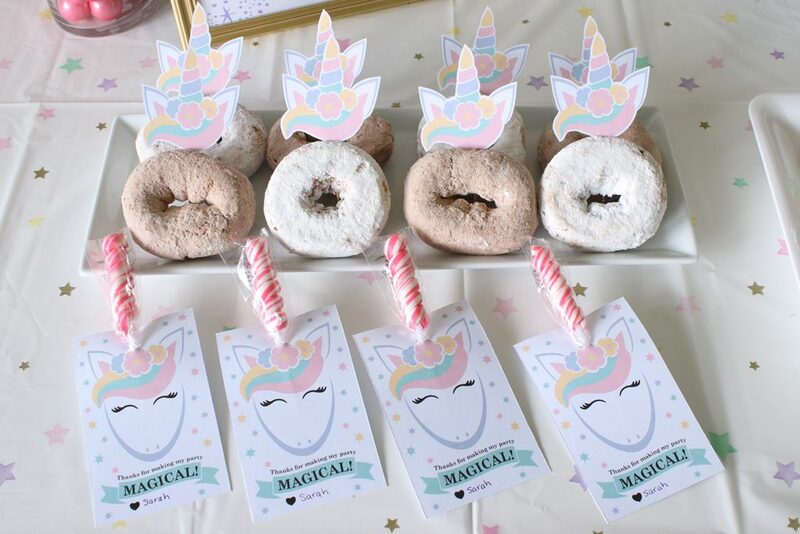 Create a DIY unicorn horn station to allow each guest to personalize their unicorn headband. Make sure friends can bring their own little sparkle and magic home with not one but two sweet favors! 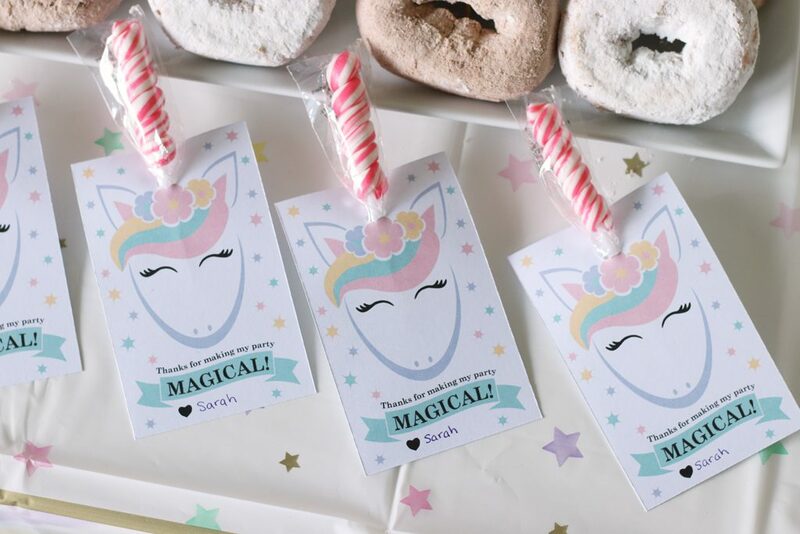 Mini unicorn lollipop sticks are the perfect treat to turn into a unicorn with the help of a lollipop favor card. 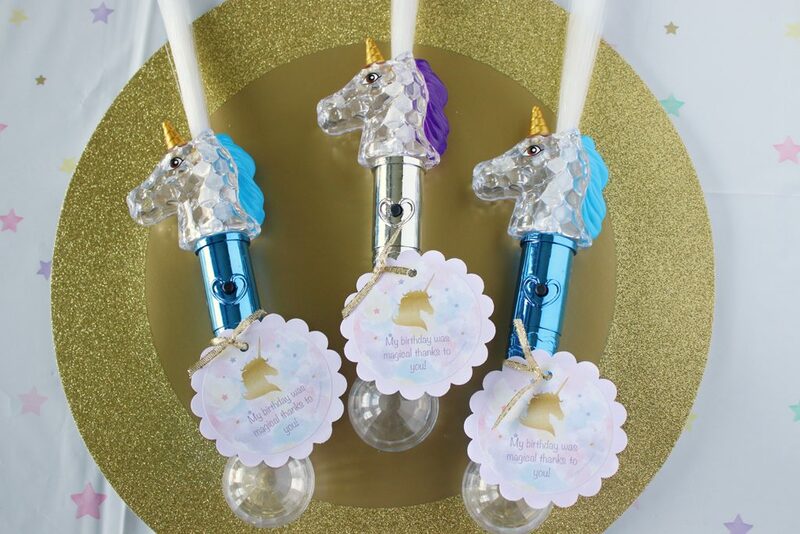 Then add a personalized tag to a light up unicorn wand and watch them light up the night!